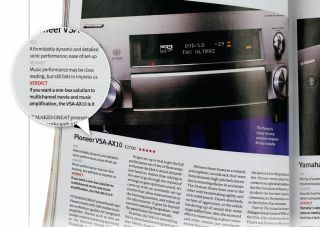 That Was Then... Pioneer VSA-AX10 | What Hi-Fi? Our regular readers will know that Pioneer has dominated the top end of the integrated AV amplifier market for much of the past decade. But that wasn’t always the case. The seeds of success were sown with the arrival of the £2700 VSA-AX10 back in 2002. At the time, Denon and Yamaha bossed most price points, including the premium market. This Pioneer broke that hegemony. There were a couple of notable ‘firsts’ with this amplifier. It was the first time Pioneer had worked with AIR studios to help fine-tune performance – a fruitful collaboration that continues to this day. It was also the first time we’d come across the company’s MCACC automatic set-up procedure. Such systems are common now, but back then we were amazed by its comprehensive nature. It did everything from set channel levels and distances to optimising the speakers for the room, although we were less taken with the time it took to do its work. Sound quality was everything we know and love about Pioneer’s higher-end amplifiers today. The VSA-AX10 sounded agile, massively detailed and impressively punchy. Today’s SC-LX88 mirrors these traits to a remarkable degree. There’s a pleasing degree of consistency between the two amplifiers when it comes to sonic balance and overall presentation, and that’s a fine testament to the work done at AIR studios. Of course, the newer amp adds modern features such as 4K compatibility and Dolby Atmos – such things didn’t exist back in the older one’s day – but the VSA-AX10’s sonic DNA remains pretty much undiluted. The SC-LX88 is as informative and exciting as we could hope for and - like its ancestor did - sets the standards at its price.